Sorry you didn't like Crash more than that. Well, it is clearly not any actors film, it's one of those films that looks at many different characters and how they connect at certain points only (a "genre" I enjoy very much). As such Sandra's part is obviously a "small" one, but I thought she was quite good in it. Oh... yeah... I thought she was good in it too. A bionic spy steals top-secret information from the Pentagon and Steve Austin and Jaime Sommers are put under suspicion. Meanwhile, Dr. Rudy Wells completes his latest Bionic project Kate Mason (Sandra Bullock), a former paraplegic who receives cybernetic implants that make her the strongest fastest woman alive. When Oscar Goldman is kidnapped by enemy agents, it's up to Jaime, Steve and Kate to save him and stop the Bionic spy from causing an international incident at the World Unity Games. This is a DVD I made off of an old home recording... so unfortunately while watchable... the video left a little to be desired. 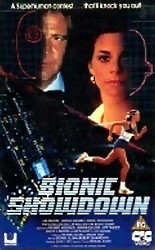 In this TV movie Sandra Bullock plays Kate... the newest Bionic Woman. Of course at the time this was made I had no idea who Sandra Bullock was. But I do remember that even then I was impressed with her. I have been a fan of both The Six Million Dollar Man and The Bionic Woman since they originally aired. So I really enjoyed every moment of this reunion movie. Matter of fact it is actually my favorite of all the bionic reunion movies. One I have watched many times already since making my DVD last year. Hold on tight for a rush of pulse-pounding thrills, breathtaking stunts and unexpected romance in a film you'll want to see again and again. KEANU REEVES stars as Jack Traven, an L.A.P.D. SWAT team specialist who is sent to diffuse a bomb that a revenge driven extortionist (DENNIS HOPPER) has planted on a bus. But until he does, Jack and one of the passengers (SANDRA BULLOCK) must keep the bus speeding through the streets of Los Angeles at more than 50 miles per hour — or the bomb will explode. 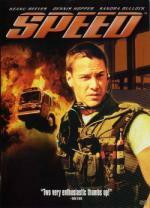 A high-octane chase of suspense, nonstop action and surprise twists, SPEED is a joyride sure to keep everyone on the edge of their seats. This is the first time I watched this movie in about 3 years. And I must say I really enjoyed watching it again. It is filled with lots of great action. My favorite character has to be Annie (Sandra Bullock) of course!... but after her I liked Keanu Reeves. I think both of them did an excellent job. This is definitely one I would recommend. Sylvester Stallone and Wesley Snipes go at it amid a dazzling cyber-future in this explosive hit. In 2032 archcriminal Simon Phoenix (Snipes) awakens from a 35-year deep freeze in CryoPrison to find a serene, non-violent Los Angeles ready for the taking. Unable to deal with Phoenix's brutal 1990s style, officials seek an old-fashioned cop to fight old-fashioned crime. They revive Sgt. John Spartan (Stallone), unjustly serving a CryoPrison sentence because of his last encounter with Phoenix. Sandra Bullock and Benjamin Bratt (TV's Law and Order) also uphold the law in this "terrific mix of action and humor" (Joel Siegel, Good Morning America/ABC-TV). To me this is just a fun movie... it is a good mixture of comedy (almost to the point of being silly) and action. A movie I have enjoyed watching countless times. Sure it is far fetched... pretty much have to suspend believability... but I think as long as you can do that you can definitely enjoy this movie. I thought Sandra Bullock was hilarious in this movie,,, but of course Stallone and Snipes were also good. It is one I would recommend. This one holds up well. I love it.